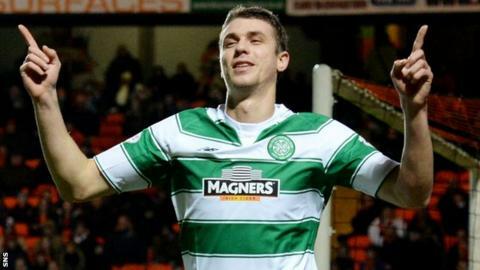 Celtic's Croatian defender Jozo Simunovic will be absent for four to six weeks with knee ligament damage. The 21-year-old, who arrived from Dinamo Zagreb in the summer, last featured in the 3-1 victory over St Johnstone on 23 January. Simunovic, who missed Sunday's League Cup semi-final defeat by Ross County, also had a spell on the sidelines in the first half of the season. Kris Commons is close to a return from a muscle injury. The midfield playmaker, 32, has missed the last three matches and manger Ronny Deila said Wednesday's visit to Aberdeen "would probably be too soon" for a return. Celtic captain Scott Brown made his first appearance in two months as a late substitute at the weekend.